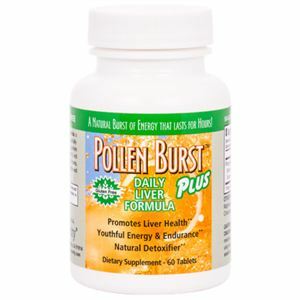 Pollen Burst Plus is a proprietary blend of extracts of pollen organically grown specifically formulated to promote healthy liver function, including the powerful antioxidant SOD (superoxide dismutase), glutathione TH, and Aloe Vera . Unhealthy diet, environmental toxins, aging and other factors can affect liver function and the body’s natural ability to detoxify. SUGGESTED USE: Take 2 tablets a day. CAUTION: Adults only. Keep out of the reach of children. If you are pregnant, nursing or taking any medications, consult your health professional before using this product. Store at room temperature and avoid excessive heat above 104 ° F (40 ° C). INGREDIENTS: [glutathione yeast extract, Aloe Vera Extract, superoxide dismutase (SOD), and pollen extract. Microcrystalline cellulose, magnesium stearate, colloidal silicon dioxide.